It is most definitely one of the most beautiful design hotels in Norway, and you can’t imagine my disappointment when I was politely told, via email, that there was no room at the inn. 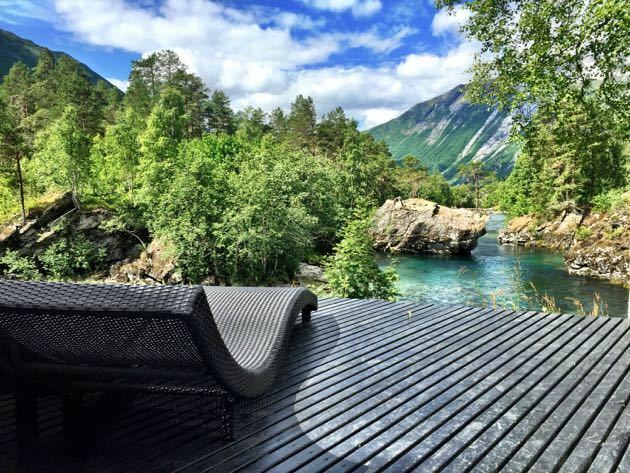 The Juvet Landscape Hotel was to be the pinnacle of a dream trip to Norway and our chosen date corresponded exactly with my husband’s birthday. As it turned out, we weren’t the only people desperate to stay there, as the property was fully booked for the entire summer. We did eventually find another lovely hotel nearby (Storfjord), but on our way there, passing by the Juvet, we just knew we had to stop and take a peek. Lucky for us, the on staff sympathized with our plight and were kind enough to give us a tour so that we could fully appreciate what we were missing. The Juvet Landscape Hotel was designed by Oslo-based firm Jensen & Skodvin. 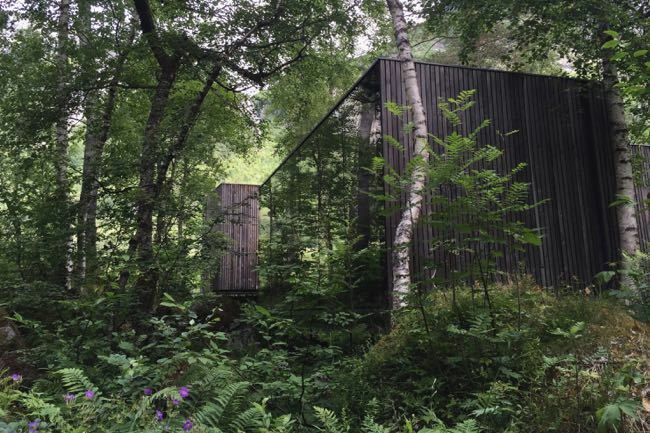 There are 7 individual houses (each with 2 full glass walls), as well as 2 “birdhouses” tucked in behind; all uniquely positioned to make the most of the incredible river, mountain and forest views. In addition, there are several more traditional rooms available in the mill house, the barn and the restored farmhouse. 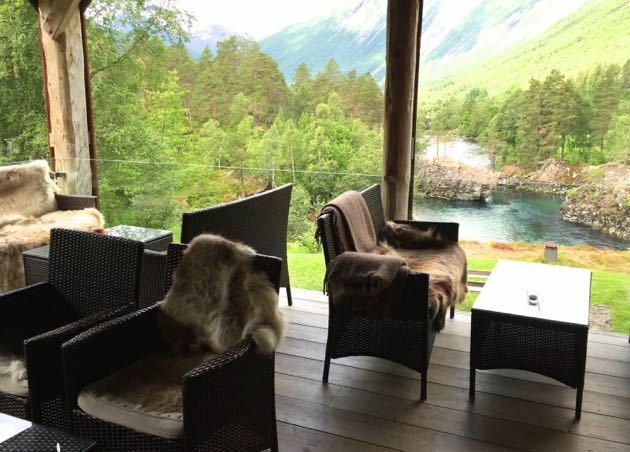 After a day spent hiking (walking on the same trails as King Olaf over 1000 years ago), river rafting, sightseeing to the nearby Geirangerfjord, swimming in the glacier-fed river or just reading a book and enjoying the gorgeous scenery, guests gather to enjoy a communal meal in the old barn. Overlooking the river, and almost invisibly tucked into the landscape is the lovely spa. Facilities include a steam room, hot tub, and beautiful relaxation areas from which to enjoy the tranquility. 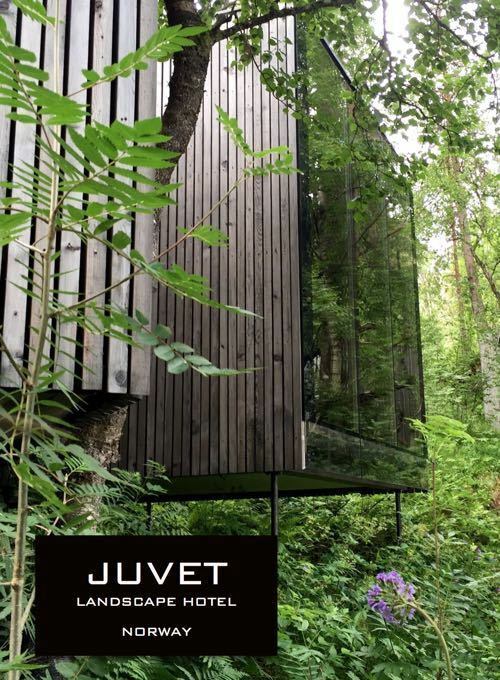 The Juvet Hotel is located in Valldalen, about a 2 hour drive from the town of Alesund. An airport pickup can be arranged through the hotel or you can take a bus. Alternatively, you can rent a car to fully enjoy the area. I strongly recommend the latter as there is so much to see in and around Valldalen. 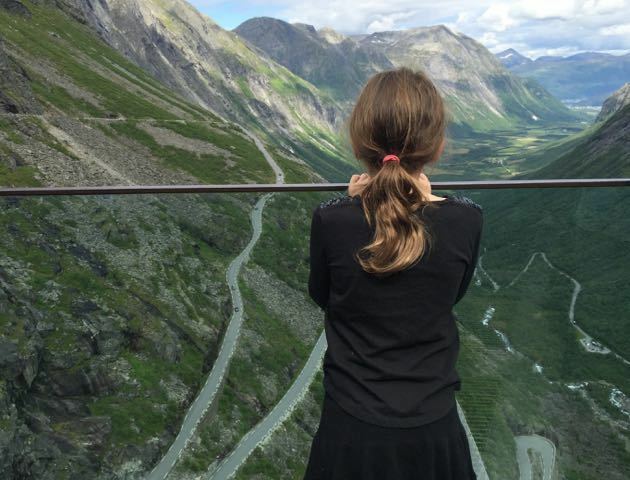 We took a day to drive from Alesund, through a town called “Hell”, past countless beautiful waterfalls, up the windy Trolls Highway (Trollstigen), and alongside one of the most incredible fjords in Norway (Geirangerfjord). What I truly wish I could put in to words, however, is the taste of the most delicious strawberries on the planet, purchased roadside from a village not far from the Juvet. As mentioned, the rooms book out way in advance, so reserve as early as possible. Most of the little houses on the property sleep two people, but if you are traveling with kids, houses 6 and 7 also have sofabeds. The “birdhouses” are suitable for singles, and larger groups can rent out the farmhouse for events (several bedrooms, a bathroom and kitchen). For booking, see the Juvet Hotel website, and see Tripadvisor for Juvet Hotel reviews (4.5/5 from guests). If you have not seen it already, watch the Oscar winning film Ex Machina (2015). Much of the movie’s exterior shots were filmed at the Juvet Landscape Hotel. Disclosure: We were not compensated in any way for this post. As always on this website, I recommend that you also read reviews from other travelers (TripAdvisor, Google, etc.) prior to making a hotel booking.